Whiny, unlistenable wuss-rocker John Mayer gets his own TV show? And it turns out that, on the show, he comes off as kind of a jerk? Dear GOD, VH-1 must be SO desperate. Maybe they should just re-run I Love The 80's Part Three, The Revenge: The Third Week in July, 1983 for the twenty-eighth time and forget it. Why must people continue their obsession with mediocre, unchallenging entertainment? 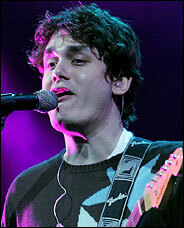 John Mayer? Kelly Clarkson? Ashlee Simpson? Gag me with an iPod. It's bad enough these hacks have ruined radio- do we need them destroying our glorious Tube as well? An interesting note on "Mugsy" Martha Stewart's new talk show- she'll do it in front of a live studio audience. That adds an entirely new dimension, giving Martha the chance to really show her true self. We can't wait to watch her hiss at haus fraus in the front row while bedazzling and scrapbooking. The show, focusing on what a spokeswoman referred to as the "home arts," is a prime candidate to replace the coincidentally and utterly replaceable Jane Pauley yakker next fall. Fans of Comedy Central megastar Dave Chappelle can stop waiting for his new book. After bitching from both sides, they just decided to forget the whole thing. Which is a shame. Dave can probably use the money, with his finances sustained only by his paltry $50 million Comedy Central deal (peanuts!) and the meager sales of the Chappelle's Show DVDs (selling only a few million copies). Singin', dancin fool Wayne Brady will star in a new sitcom for NBC about the hilarious hijinks at a personal injury law firm. Apparantly, focus groups are clamoring for a comedy featuring lawyers dancing and singing tunelessly around a water cooler. One of the following items about fallen child star Dana Plato is more doctored than the height on Gary Coleman's driver's license. Which is the phony?